The central nervous system, like any system of the body, requires constant oxygenation and nourishment. The brain has a particularly high oxygen demand – at rest it represents one fifth of the body’s total oxygen consumption. It is also very sensitive to oxygen deprivation, with ischemic cell death resulting within minutes. There are two paired arteries which are responsible for the blood supply to the brain; the vertebral arteries, and the internal carotid arteries. These arteries arise in the neck, and ascend to the cranium. Within the cranial vault, the terminal branches of these arteries form an anastomotic circle, called the Circle of Willis. From this circle, branches arise which supply the majority of the cerebrum. Other parts of the CNS, such as the pons and spinal cord, are supplied by smaller branches from the vertebral arteries. We shall now look at these individual components in more detail. The internal carotid arteries (ICA) originate at the bifurcation of the left and right common carotid arteries, at the level of the fourth cervical vertebrae (C4). They move superiorly within the carotid sheath, and enter the brain via the carotid canal of the temporal bone. They do not supply any branches to the face or neck. Ophthalmic artery – Supplies the structures of the orbit. 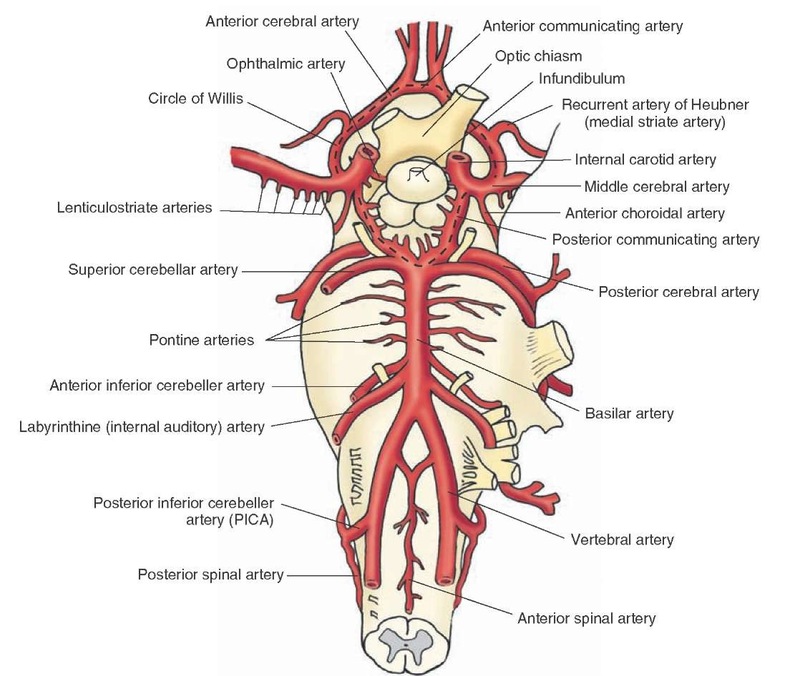 Posterior communicating artery – Acts as an anastamotic ‘connecting vessel’ in the Circle of Willis (see ‘Circle of Willis’ below). Anterior cerebral artery – Supplies part of the cerebrum. The internal carotids then continue as the middle cerebral artery, which supplies the lateral portions of the cerebrum. The right and left vertebral arteries arise from the subclavian arteries, medial to the anterior scalene muscle. They then ascend up the posterior side of the neck, through holes in the transverse processes of the cervical vertebrae, known as foramen transversarium. Meningeal branch – supplies the falx cerebelli, a sheet of dura mater. Anterior and posterior spinal arteries – supplies the spinal cord, spanning its entire length. Posterior inferior cerebellar artery – supplies the cerebellum. After this, the two vertebral arteries converge to form the basilar artery. Several branches from the basilar artery originate here, and go onto supply the cerebellum and pons. The basilar artery terminates by bifurcating into the posterior cerebral arteries. The terminal branches of the vertebral and internal carotid arteries all anastamose to form a circular blood vessel, called the Circle of Willis. Anterior cerebral arteries: These are terminal branches of the internal carotids. Internal carotid arteries: Present immediately proximal to the origin of the middle cerebral arteries. Posterior cerebral arteries: These are terminal branches of the vertebral arteries. Anterior communicating artery: This artery connects the two anterior cerebral arteries. Posterior communicating artery: A branch of the internal carotid, this artery connects the ICA to the posterior cerebral artery. There are three cerebral arteries; anterior, middle and posterior. They each supply a different portion of the cerebrum. The anterior cerebral arteries supply the anteromedial portion of the cerebrum. The middle cerebral arteries are situated laterally, supplying the majority of the lateral part of the brain. The posterior cerebral arteries supply both the medial and lateral parts of the posterior cerebrum. Anterior spinal artery – formed from branches of the vertebral arteries, travelling in the anterior median fissure. Gives rise to the sulcal arteries, which enter the spinal cord. Two posterior spinal arteries – originate from the vertebral artery or the posteroinferior cerebellar artery, anastomosing with one another in the pia mater. However, below the cervical level supply from these longitudinal arteries is insufficient. There is support via anastomosis with the segmental medullary and radicular arteries. The anterior and posterior segmental medullary arteries are derived from spinal branches of a number of arteries, before entering the vertebral canal through the intervertebral foramina. The great anterior segmental artery of Adamkiewicz reinforces circulation to the inferior 2/3 of the spinal cord, and is found on the left in the majority of individuals. The radicular arteries supply (and follow the path of) the anterior and posterior nerve roots. Some radicular arteries may also contribute to supplying the spinal cord. The brain is particularly sensitive to oxygen starvation. A stroke is an acute development of a neurological deficit, due to a disturbance in the blood supply of the brain. Thrombosis – Obstruction of a blood vessel by a locally forming clot. Embolism – Obstruction of a blood vessel by an emboli formed elsewhere. Hypoperfusion – Lack of blood supply to the brain, due to systemically low blood pressure (e.g shock). Haemorrhage – An accumulation of blood within the cranial cavity. Out of these four, the most common cause is embolism. In many patients, an atherosclerotic emboli will arise from the vessels of the neck. An aneurysm is a dilation of an artery, which is greater than 50% of the normal diameter. They most likely to occur to occur in the vessels contributing to the Circle of Willis. They are particularly dangerous – producing few symptoms until they rupture. Upon rupture, blood typically accumulates in the sub-arachnoid space – with a subsequent increase in intracranial pressure. Once the artery wall has ruptured, it is a medical emergency, and the patient is likely to die unless treated swiftly. Treatment of an intracerebral aneurysm is surgical. Spinal cord infarction (also known as a spinal stroke) refers to the death of nervous tissue, which results from an interruption of the arterial supply. Clinical signs of spinal cord infarction include muscle weakness and paralysis with loss of reflexes. The most common causes of infarction are vertebral fractures or dislocations, vasculitic disease, atheromatous disease, or external compression (e.g. abdominal tumours). 95% of spinal cord ischaemic events are to the anterior aspect of the spinal cord, with the posterior columns preserved. Treatment is by reversal of any known cause.